The next generation of echo canceling hardware for Asterisk! This and other Digium T1 hardware are available from our Asterisk store located at the home page.. The Digium TE407P and TE412P are the next generation of Digium hardware that offer on-board Octasic echo cancellation, each compatible with a 5.0- volt and 3.3-volt slot respectively. Echo cancellation is supported for four full T1s or J1s (96 channels), or E1s (124 channels) to eliminate echo and improve voice quality in situations where software echo cancellation is not sufficient, where echo cancellation is not done at the CO, or where CPU utilization must be minimized. By supporting 128ms of echo cancellation on each and every channel, the card will perform in the most difficult environments while providing capacity/length tradeoff. 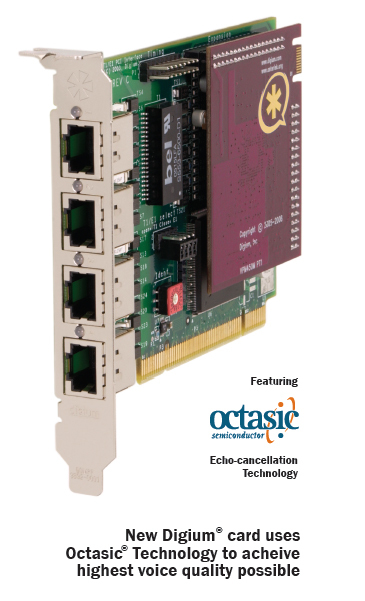 The Digium TE407P/TE412P provides robust echo cancellation on the network side for situations involving a 4-to-2 wire hybrid, giving users its highest performance. Digium has designed the TE407P/TE412P to be fully compatible with existing software applications and it is fully integrated with the open source Asterisk as well as with Asterisk Business Edition. The open source driver supports an API interface for custom application development, so developers can more accurately meet their needs. The new Digium TE407P/412P performs high quality echo cancellation and Voice Quality Enhancements (VQE). The Digium TE407P/412P adds a series of Octasic voice processors which apply a Least Squares adaptive filter algorithm with frequency awareness providing superior performance for today’s solutions. Therefore, the Digium TE407P/412P can significantly increase density in voice gateways while offloading DSPs to maximize their use for other features. When tested by leading carrier labs, the Octasic algorithm received very high marks and was labeled a benchmark-algorithm for echo cancellation.